Herbs are good for your health and wildlife will benefit too! Growing herbs indoors or out – they look great, they smell great and they taste amazing. And they are good for the environment too. Growing herbs is easy and fun and an easy way to enhance your green living. If you like cooking and enjoy the benefits of fresh tasty organic food from your garden, grow herbs. It’s a great way to supplement your diet. Most culinary herbs are rich in nutrients as well. Even if you have no garden or outdoor space it is not hard to grow herbs indoors, at least for some of the time. Picture: Herbs in planters are quite easy to manage. Growing herbs indoors is possible with a good many varieties, depending upon where you live and what you want to grow, so it's not even essential to plant a herb garden. Many herbs also have therapeutic properties which make them ideal natural remedies. For example, mint is a "digestive", that is, it aids digestion and thyme has anti-bacterial qualities. Health enhancing herbs are to be found amongst many of the common herbs in gardens. Many simple herbal remedies can be made from herbs grown at home. Click here to see good books on growing herbs. Why are herbs good for the environment? Many herbs attract beneficial insects such as bees and hoverflies. Many of these insects are now under severe stress from our polluting habits and the increased chemical load from agriculture. Some herbs are also useful companion plants which make growing vegetables so much easier without harmful sprays or poisons. If you are growing herbs indoors, you may notice that some of them help indoor air quality. Some even have a reputation for deterring houseflies. Some of the easiest herbs to grow are also the most useful. It's wonderful to be able to help yourself to handfuls of fresh, organic herbs whenever you want. Parsley, sage, rosemary and thyme – called to mind from the famous folk song - are all easy if you have a garden in a temperate region of the world. Mediterranean herbs such as marjoram and basil are not difficult either. 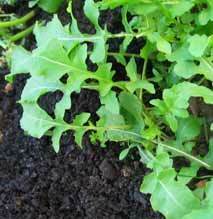 Rocket and chives are more easy choices, especially for growing herbs indoors, as they are relatively small. Chives like cool conditions, so avoid direct sun. Most small herbs can be grown in containers - or even inside the house, especially if you have a sunny and well lit space. Plants grown on windowsills can become leggy and weak because the light is insufficient. Container gardening is easy and rewarding and many herbs do well in containers. See Designing a container garden for more on container growing. For best results, dedicate an area of your garden close to the kitchen to grow herbs. It’s nice to know that there is a place where you can find something tasty at any time of the year to uplift your cookery! If you are planning on growing herbs indoors for some of the year, a small container garden of herbs in tubs and pots can be a workable solution. The soil does not have to be especially rich. Many herbs grow well in quite poor sandy and stony soils in their native settings. So choose somewhere sunny but close to the kitchen and don’t worry too much about soil quality, as long as the ground is well drained and there are no problems with the soil (such as pollution). It's a good idea to plan your herb garden before you plant anything. Place woody herbs such as rosemary where there is plenty of space. Keep border areas for small annual herbs. Select a separate space for dominant herbs such as mint or tarragon. Buy good quality herb seed or use herb seeds from a friend's garden. I find it’s easiest to start most herbs off in seed trays. That way you can keep a close eye on them and they don’t get lost in weeds when you get busy with other things. If you are growing herbs indoors it is not so necessary to start using seed trays. 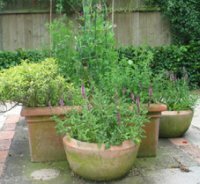 You can select some suitable pots and sow annual herbs such as basil straight into the compost or soil. Make sure you sow the herb seeds thinly enough so that they are not overcrowded as they grow. You may need to do some thinning to create enough room for your growing crop. Larger thinnings can be washed and used in salads. Buy good quality seed, organic if possible, and follow the instructions closely. Below you will find instructions and tips for a few of the commoner useful culinary herbs to get you started. Some of the herbs detailed below are also valuable as medicinal herbs. Not all of the herbs below are suitable for growing indoors. Most of the common herbs are quite easy to grow. Try parsley sage rosemary and thyme for a start - and add in mint and lavender, too. These are all easy common herbs that can be found in most good garden centres. See Easy Herbs for Your Garden or Yard for details of growing these and other easy choices. This is not a complete list of herbs which are suitable for growing at home. It is simply a small common selection to introduce you to the pleasures and benefits of growing culinary herbs, if you have not already experienced this way of greening your diet and lifestyle. Growing herbs indoors and out for culinary use can be a great hobby. Apart from the many health benefits, they can also help your budget. Fresh herbs are expensive in supermarkets and greengrocers so having a ready supply at home is well worth the small amount of effort needed. There are many, many more fabulous herbs that you can grow which will enhance your garden and your kitchen. Here are some good books on growing herbs. Here are a few good books I've found which are a great help when growing, using and appreciating herbs. Anything by Juliette de Baracli-Levy is well worth reading but unfortunately most of her books seem to be out of print. She gives a lot of therapeutic uses for herbs and details of ethnic herb use. She did lots of testing natural remedies on herself and her animals and was an acute observer. She was a great believer in herbal health cures - nature's medicine chest. Herbs & Spices: The Cook's Reference is a brilliant book for the kitchen. Little Herb Gardens: Simple Secrets for Glorious Gardens--Indoors and Out has plenty of detail on how to grow herbs indoors and out. I've also enjoyed books by Joy Larkcom; her books on salad growing are excellent and include many herbs. See the one shown on the right for an example. See other herb books from Amazon on the sidebar. I'm sure you'll agree that growing your own herbs has huge benefits for your health, well-being and enjoyment of foods and your garden! It's also possible to grow herbs for their therapeutic qualities. Grow herbs to contribute to a green lifestyle too, as many of them attract bees and butterflies. Also grow herbs because they are a valuable addition to your diet and you are saving on food miles by not buying them from the supermarket. So growing herbs indoors and out is good for your health and for the environment. You can also grow herbs for their powers as natural dyes and you could also grow them as companion plants. You can also grow herbs just for their scent... or even, grow herbs just because they look nice! While growing herbs indoors is a great way to help your diet during the winter, for me the best way to grow most herbs is outdoors where they can enhance the garden and grow to their full potential.